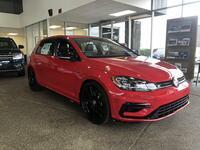 If a powerful hatchback is what you need, the 2019 Volkswagen Golf R in McMinnville, OR is the vehicle for you. While the 2019 Volkswagen Golf is known by many for its efficiency and the 2019 Volkswagen Golf SportWagen is known for its utility, drivers love the 2019 Volkswagen Golf R because of its phenomenal engine performance and handling. Coming installed with a turbocharged, four-cylinder, 2.0-liter engine outputting 288 horsepower and 280 pound-feet of torque, it’s easy to see why drivers celebrate this hatchback’s performance. This engine comes paired with a standard six-speed manual transmission, though an optional seven-speed dual-clutch automatic transmission is also available. One major update Volkswagen made to the Golf R for 2019 is the addition of numerous exterior color options. There are over 40 exterior color options available for the 2019 Volkswagen Golf R.
The 2019 Volkswagen Golf R doesn’t only impress because of its powerful engine, but because of its spacious interior and various standard features as well. With the rear seats up, the 2019 Volkswagen Golf R has 22.8 cubic feet of cargo space. By folding down the rear seats, drivers can enjoy a maximum cargo capacity of 52.7 cubic feet. Advanced driver assistance features are also plentiful inside the 2019 Volkswagen Golf R. Every model comes standard with automatic high beams, a lane departure warning system, pedestrian detection, rear cross-traffic alert, blind-spot monitoring, front and rear parking sensors and a forward collision warning/mitigation system. Available 2019 Volkswagen Golf R comfort features include: Volkswagen Car-Net Guide & Inform navigational services, Volkswagen Car-Net App-Connect smartphone integration, a rearview camera, Bluetooth support, heated seats, ambient interior lighting, Volkswagen Digital Cockpit, keyless access with push-button start, adaptive cruise control and dual-zone automatic climate control. Interested in a 2019 Volkswagen Golf R?